Lambert Instruments' Fluorescence Lifetime Imaging Attachment is a system that can be attached to almost every fluorescence microscope and enables to make fluorescence lifetime images but can also be used for normal fluorescence imaging. The price level of the system is such that it comes in the reach of many researchers. Quantitative fluorescence microscopy uses the intensity of the fluorescence to extract information about the local concentrations of molecules that are labeled with fluorescent probes. This technique suffers from the fact that the fluorescence of the probe is permanently destructed by light-induced conversion of the probe material to a non-fluorescent compound. This photochemical process is called "bleaching" and makes it necessary to regulate the excitation dose in an economical way. Another physical property of fluorescent molecules is the fluorescence lifetime. The fluorescence lifetime is the decay time of the emission after the excitation has been stopped. The fluorescence lifetime depends on the local concentrations of certain molecules or ions. Changes in fluorescence efficiency as caused by bleaching are not accompanied by changes in fluorescence lifetime. 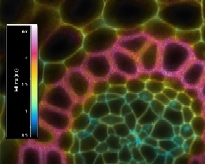 Fluorescence lifetime imaging microscopy (FLIM) merges the information of the spatial distribution of the probe with the lifetime to increase the reliability of the concentration measurements. Additionally, FLIM enables the discrimination of fluorescence coming from different dyes, including auto-fluorescent materials, that exhibit similar absorption and emission properties but showing a difference in fluorescence lifetime. In contrary to other systems that work in the time domain our system works in the frequency domain. This method requires a modulated light source and a modulated camera. The excitation light is modulated in a sinusoidal fashion. The fluorescence intensity shows a delay or phase-shift with respect to the excitation and a decrease of modulation-depth. The phase-shift and modulation-depth depend on the decay constants of the fluorescent material and the modulation frequency. To extract the phase-shift and the modulation-depth of the fluorescence light an intensified camera is used. The sensitivity of the intensifier is modulated with the same frequency as the excitation modulation, but with an adjustable phase-shift. The output signal level depends on the phase-shift of the fluorescence signal relative to the modulated sensitivity of the camera. A series of measurements is made at increasing phase-shifts and a sine is fitted through the series. The modulation-depth and phase-shift of the sine are used to extract the decay constants that are present in the fluorescence emission. To create the fluorescence lifetime image, a series of images is captured at different camera modulation delays and the calculations are performed for each pixel of the images. As a detector an intensified camera is used. The gain of the intensifier can be modulated. The camera is connected to a computer by means of a GPIB interface for controlling the settings of the camera and a framegrabber imports the image data to the computer. As the excitation light source a modulated LED or Laserdiode is used which is mounted on the place of the lamp in the standard lamp house of the microscope. For modulation both the camera and the LED are connected to the sinewave generator in the FLIM electronics box. This generator has two outputs. The frequency and amplitude of both outputs and the phase shift between them is controlled by software via a RS-232 interface. A software package controls all the settings of the camera and the light source, calculates the lifetime of each individual pixel and presents the lifetime image in false colors. The lifetime value of each individual pixel can be read on the status bar by pointing it with the mouse.